Digital signage allows you to send targeted messages to one or several locations from a central point, be it a reception desk or a communications department. Many medical and healthcare offices, hospitals and clinics will benefit from digital signs as they are a versatile and cost effective tool in your healthcare marketing toolbox. Not only that, they provide an efficient way of delivering messages to patients and staff. 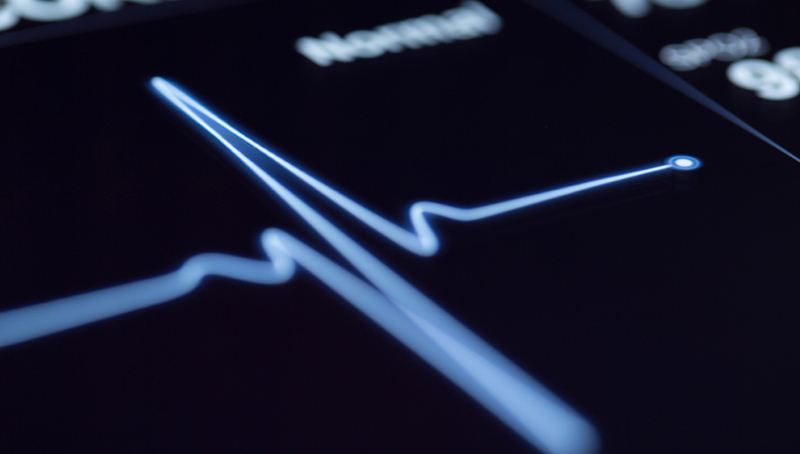 One of the main reasons healthcare establishments would want to make use of digital screens is to deliver important messages, such as; reminders, staff messages, general information, key healthcare matters and adverts of products. However, the messages may be either aimed at customers or staff, or both, meaning that location is key. The content you display will be different for each, but the length of content should be considered, too. Staff and patients will never watch long videos shown on digital signage in corridors. Short and straight to the point messages are best to show in areas that people don’t tend to spend as much time in. On the other hand, a place such as a waiting room would be more suitable for longer communications such as videos. As we are all aware, waiting around can be quite frustrating, so delivering interesting and entertaining content is a great way to keep your patients happy. 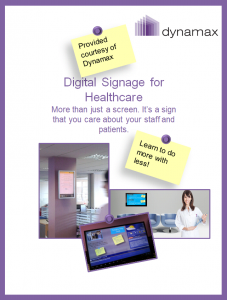 Here at Dynamax we can provide you with a digital signage solution (digitalsignage.NET) tailored to your needs, that will enhance your patients experience and also improve your communications for staff. Communication is key to a smooth running of day-to-day activities and routine procedures. If you would like to experiment with our digital signage software for free, with no obligations click here to request a consultation. Or download our ‘Digital signage for Healthcare’ white paper for extra information, for free. 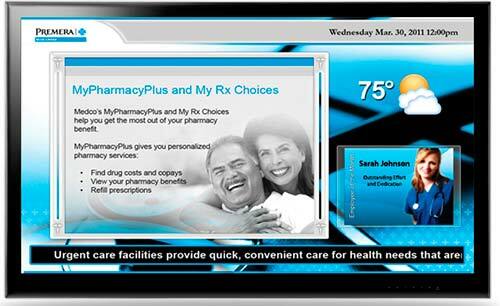 This entry was posted in Digital Signage, Heathcare, Tips and advice by Dynamax. Bookmark the permalink.